I'm constantly overwhelmed by art and art history. As much as I love it, its immensity is somewhat daunting. You can tell how immense it is by going to, for example, the Italian Renaissance wing of the Louvre. Sure everyone knows Da Vinci, Michel-Ange, Donatello, but there are so many more artists of just that epoch. Combine that with numerous countries and civilizations each with thousands of years of history and theres a lot to see, let alone understand. Yet, some of my interest lies in this daunting nature. There will always be more to learn and to see, and the challenge of the immensity is appealing. Its a subject that will interest me for my whole life, and it seems it may take that long as well to get it down. Pablo Picasso is an artist that I honestly know very little about. 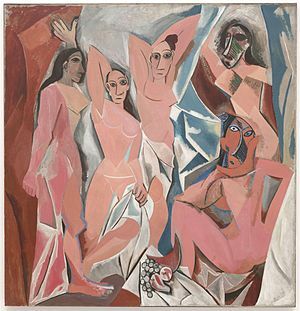 I know he's famous, Spanish, I've learned about his Cubist works and have spent hours studying and pondering Les Demoiselles d'Avignon. But the man had a career that spanned half a century and I know very little of it. Why?, you may ask. The answer is simple, I haven't taken a modern art class yet (that's coming next semester) and the Picasso Museum in Paris is closed for renovation. So its not for lack of interest. In modern art, people often speak of the process as an important factor. This film gives a fascinating look at the process, as you see canvases being created one brushstroke at a time, a rare opportunity. I recommend it for all.